Strike for Climate: Has your school made contingency plans? Discussion in 'Education news' started by RebellingforLife, Jan 3, 2019.
why are there so many stupid people that have the power to make positive difference to our world but still: build houses on tidal flood plains, use potable water to flush toilets, have no plans to reverse desertification and allow car manufacturers to make cars designed for domestic purposes with 2l engines capable of going 150mph. All I see is a confirmed cycle of ice age / tropical sunshine that had no relationship/correlation with the existence of human beings. PS - I would argue that building on flood plains, use of potable water and desertification are effects of global warming not causes but I fear that may be lost. I can't help but think that the title of this thread is somewhat leading. Apologies, I digressed trying to persuade people that climate change was a thing and the action being taken by young people ought to be taken seriously. Back to the school strike and here's action some from today; 22000 in Switzerland, 25000 in Germany and others across the world. It's growing. Is it the student version of Ready To Learn, that sin bin room they had in ‘School’? I can’t comment because I not seen the show, which I take it is what “School” is. Brussels; 10 000 last week, over 30 000 this week. Another 30k turnout in Brussels today following a 70k demo there at the weekend. The 15th February is strike day in the UK. Tens of thousands strike in Europe yesterday and today. Strike action will be taking place in at least 27 UK cities next Friday. Let's hope that all head teachers and principals follow union guidance and encourage their students to down pens, get out there and protest. NAHT have said nothing of the sort. That's just media spin. The only source is the Sunday Express today and the anonymous NAHT spokesman they quote says nothing about encouraging students to down pens and get out and protest. Read it. strawbs and colpee like this. "When you get older pupils making an informed decision, that kind of thing needs to be applauded. Society makes leaps forward when people are prepared to take action. Schools encourage students to develop a wider understanding of the world around them. A day of activity like this could be an important and valuable life experience." Demonstrations are now planned at 38 locations on Friday. It's not an explicit statement but a semantic discussion of the above would be pointless. "We"? Which "we"? You mean you? I doubt many heads will assume that, not least because it doesn't appear on NAHT website as guidance nor (according to an NAHT head friend of mine) has there been an NAHT mailing to members with this so-called "guidance". 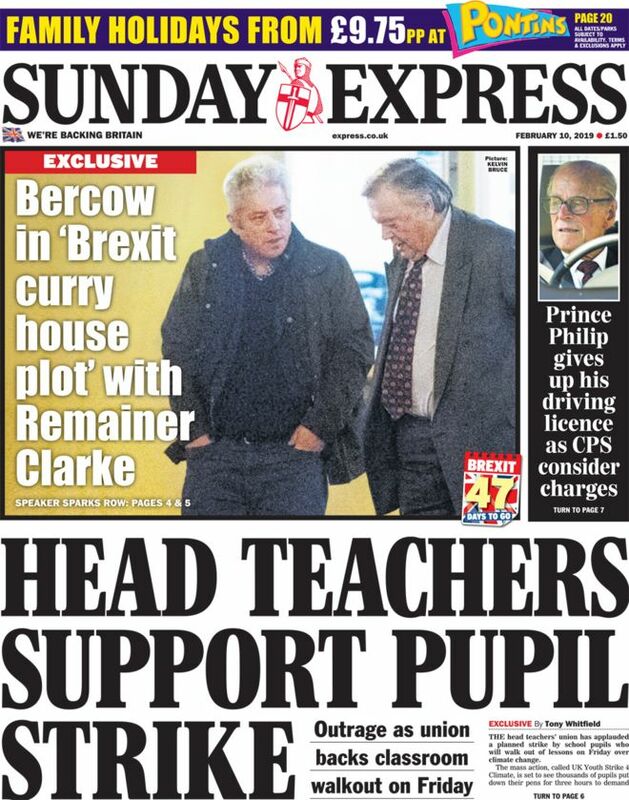 NAHT doesn't usually give guidance to its members via the front page of the Sunday Express. ... it doesn't appear on NAHT website as guidance nor (according to an NAHT head friend of mine) has there been an NAHT mailing to members with this so-called "guidance". According to the Guardian today NAHT have clarified that they are not supporting pupils "going on strike" on Friday, saying "There is no reason why a young person's desire to get involved in social issues should get in the way of their schooling". So no guidance to heads to encourage or allow pupils to strike then. strawbs and border_walker like this. "There is no reason why a young person's desire to get involved in social issues should get in the way of their schooling". I can see where this is coming from but climate change is now much more than a social issue. You could make a good case that missing a day or two of school pales in comparison to the dangers we are facing. I fully understand that schools cannot officially sanction such action, but I see it as part of the whole whereby people are realising just what a predicament we are in and just how urgent it is for action to be taken. For those in the older age brackets it seems hard to grasp just what a mess we are in. Business as usual is no longer an option and our young people are realising that point more deeply than the rest of us are. They don't see anyone really listening, nor any meaningful change happening, so what is there left to do? I wonder how many striking students this Friday will be jetting off on polluting planes for a holiday on the Saturday. border_walker, strawbs and Catgirl1964 like this. we're probably screwed anyway but unless governments get behind the changes required we're definitely screwed. governments and adults, educated and otherwise, are failing to take this seriously and children are having to take this issue into their own hands to try and force themselves to listen. Put simply, if you believed that your students, your children and maybe you faced the possibilty of death from starvation or violence in the next few decades, what would your reponse be? I’m all for it but on the flip side is it a case of We don’t know what we want but we want it now? Policies may lead to a complete overhaul of standards of living that most teens completely take for granted. Take away the main source of their comfortable existences and how many will be ready for it? How many adults get up an hour earlier than necessary to do a 20 minute drive to work these days? Imagine if schools were open all summer with longer winter hols to escape escalating energy costs? So good luck to those who seek changes but are they willing to make the sacrifices it will demand of everyone? What plans need to be made? A bunch of kids fail to turn up at school on Friday? Mark them 'N' on the register and get on with the day. Who gives a monkey's toss? I certainly don't! If a student feels mature and informed enough to protest, then they will need to be mature enough to accept any negative consequences due.